There seems to be a renaissance going on with Stephen King properties. Projects in the last few years have taken adaptations of his work more seriously, with great results. 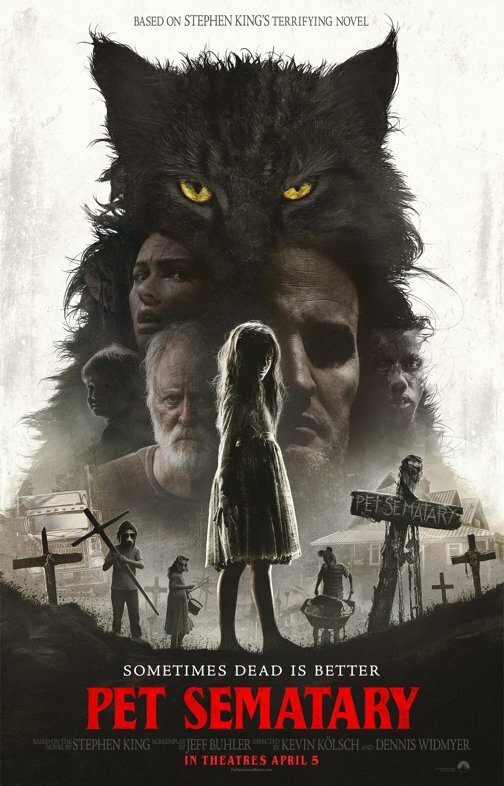 Add Kevin Kolsch and Dennis Widmyer’s take on Pet Sematary to that list. Louis and Rachel Creed, along with their children Ellie and Gage, move from Boston to a small country town in Maine in order to slow down. Their only neighbor, Jud Crandall, is a grizzled old man with a heart of gold. He takes a liking to the Creed family. When the family cat, Church, is killed, Jud’s fondness for the family – especially Ellie – leads him to make a terrible decision. When he takes Louis out to the neighborhood pet “sematary,” deep in the woods, to bury Church, he changes his mind and takes Louis a little further into the forest to bury the cat. Louis’ mind boggles when Church returns to the family, fully alive, but with a bad anti-social streak. The cat does not endear himself to the family, and Jud apologizes, realizing it had been wrong to introduce Louis to the magic on the woods. You know what happens next. During her birthday party, a truck accident leaves Ellie dead and her family heartbroken. Louis sends Rachel and Gage to the city for a few days while he deals with some things. Those things being Ellie, and reburying her past the pet sematary. She returns, of course, but isn’t the same, sweet little girl that Louis remembers. 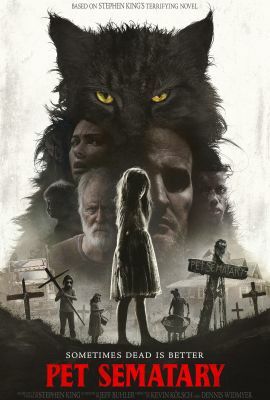 When the trailer for Pet Sematary dropped a few months ago, there was far-ranging outcry on the internet, mostly that they gave away the whole movie in the trailer. First of all, it’s an adaptation. A book and a film came before it. Of course you know the story. Second of all, they did not give away the whole movie. The third act varies wildly from either iteration before it, to wonderful effect. To say any more about the changes would be spoiling the movie. We already know from the trailer that it is Ellie who dies, not Gage. That creates a whole new trajectory for the story that takes things to a much deeper, much darker place. Pet Sematary is about death and grief, and there is plenty to go around. I think from a storytelling point, Ellie’s death has more of an impact than Gage’s. Jete Laurence brings a wonderful performance as a nine-year-old who finds herself back from the dead. Both Zelda and Pascow are in this film, and while neither are played for jump-scares, they certainly bring a nervous energy to the film. I thought that Rachel and Zelda’s relationship was more deeply portrayed in this version of the film than in the 1989 iteration. It’s not a perfect film. The first two acts seemed to drag a bit. It felt like it was pro forma, laying out the beats of the story in order to get us to the main event: the resurrection of Ellie Creed. John Lithgow, who played Jud, seemed to waiver between an antagonistic old man and a kindly grandpa figure for the first act, before finally settling on grandpa and mentor for the Creeds. And the children of the town, when they go bury a dead pet, are wearing these terrifying masks for no known reason. It simply cannot be that they find them adorable. Directors Kolsch and Widmyer, best known for 2014’s Starry Eyes, create a creepy masterpiece with Pet Sematary. It is dark, it is brooding, it is foreboding. It takes the story of a dead child and a family’s heartbreak to an even bleaker place.